I am shopping in Ross. I have come for spoons, new journals, and decorative wall plates. I am not here because I desperately need any of these items. I am here because I don’t want to face the God nudge pulling on me. He has me working on a project that I don’t want to be working on. A project of calling some people, and I am trying to escape Him — even for a few moments. So, I browse the different options of silverware, the journals stashed on the shelf, and the household accessories. And for a moment I am on hold. He won’t push me or force me to do anything, but the invitation always awaits. The truth is that listening to God is scary. He asks me to do things that completely stretch me out of my comfort zone. Sometimes I feel impressed to go up to a stranger in a store. Sometimes a name of a former student pops in my head for me to call. And sometimes — I choose not to listen. I hedge and I doubt. I get afraid and talk myself out of what God has told me. And while His assignments stretch me and pull me where I don’t always want to go, I know they are always for the best even if I don’t immediately see results. So, how do I hear from Him? I think it’s worth taking a look at some of the ways I’ve tried to block out His voice to better discover what not to do when attempting to better tune in to what He’s saying. 1. Read the Bible Without Paying Attention. Quite honestly, I went through a season where I was a little afraid of what God would tell me. As I started to see that my situation wasn’t going in the direction I wanted it to, as foolish and ridiculous as this sounds, I decided to put a “check in the box” when it came to having a quiet time with God every day. However, I wasn’t really paying attention. I read the Bible with my children running around, the TV in the background. But what I was doing was trying to control God. And because of that refusal to open up all of the places of my life to Him, I made some poor choices in that season — all because I didn’t trust Him enough to open up myself to His instruction. 2. Allow Distractions to Drown Out the Voice of God. Sometimes I don’t want to hear from God, and shopping helps with that. I think, and I know, that this moment is not about the shopping (because it rarely is). I recognize it as the human impulse of storing up, controlling my world before He starts requiring something of me. When you know God in that intimate way, there is an understanding that when He calls, it will be loud. And it will be specific. And it may require other things to go away. And it’s terrifying. So I shop. In the biblical story of Martha and Mary, Jesus rebuked Martha when she complained that Mary was not helping her with meal preparations (Luke 10:38-42). Jesus was hard on Martha, I believe, not because she wanted to serve Him and others in making a nice dinner — but because her busyness distracted her to the point that she wasn’t listening to Jesus. And when Martha wasn’t listening, she got off track. She got impatient with Mary, demanding of Jesus and fretful about her situation. The same is true of me and you. When we stop listening to Him, we lose our peace, our sense of direction — and we get impatient and critical of others. 3. Let my “Rational” Side Override God’s Voice. 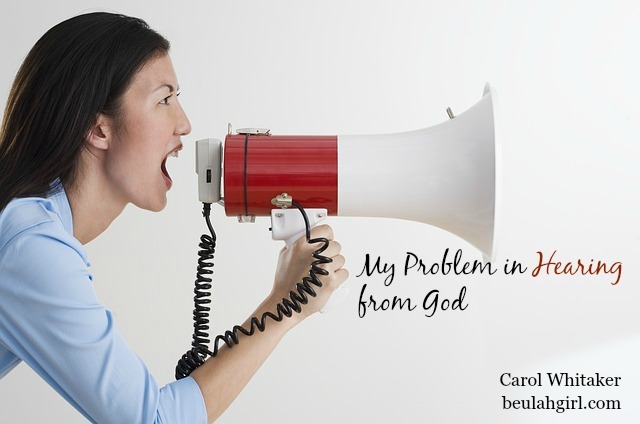 Just like Martha couldn’t understand why Jesus would allow Mary to sit at His feet rather than help her pull together an important dinner for Him, I have fallen into the trap of allowing my own “rational thinking” to drown out God’s voice. I have looked at situations through practical eyes — wisdom that I have acquired from the culture, my parents, and my friends — even wisdom from well-intentioned Christians. However, by smothering that still small voice inside of me with others’ advice, I can drown out and explain away the voice of God. Because the truth is that His instructions and ways just do not appeal to my logic at times. They usually go against what I feel must be right. Then when I check with other people to see if He could indeed be speaking to me, and they agree that the action must not be God — I can make the mistake of not taking the step He wants me to because I am relying on my own or others’ wisdom. Take, for instance, when I decided to quit my teaching job. I felt God say to me very distinctly during a sermon that I was to quit my job. However, when I brought this up with my spouse and we looked at the numbers — how we were going to afford to live on one salary — my husband pointed out how illogical it would be for me to stop working. We had a brand new car payment, a hefty mortgage with a decreased value in a sunken market, bills of all kinds. The situation truly looked impossible from a human vantage point. The more that I looked at the practical side of things, the more I talked myself out of what I thought had been His voice. Here were some of my questions based on human logic: Why wasn’t my husband excited about me quitting if God was indeed telling me to go in that direction? Why didn’t my husband make more money if we were supposed to exist on one income? Why didn’t God have a position lined up for me to transition into if He was indeed asking me to take a leap of faith and go in another direction? All of my arguments were faulty when I read yet another story in the Bible — that of Mary and Joseph — and realized that God told Mary first about the fact that she, a virgin, would bear a child. He then orchestrated some of the other things in her life to make it possible for her to do His will. Joseph wasn’t on board with the plan until an angel appeared to Him later (Matthew 1:18-25). And my husband wasn’t either until we had several intense conversations. He then relented with the stipulation that I work for one more year before quitting. At one point during the process, I gave up on the idea and told God it just wasn’t going to work. Despite my unbelief, God was persistent and gave me more chances than one to act on His call. However, He didn’t start working on the logistics in the way I thought He should. 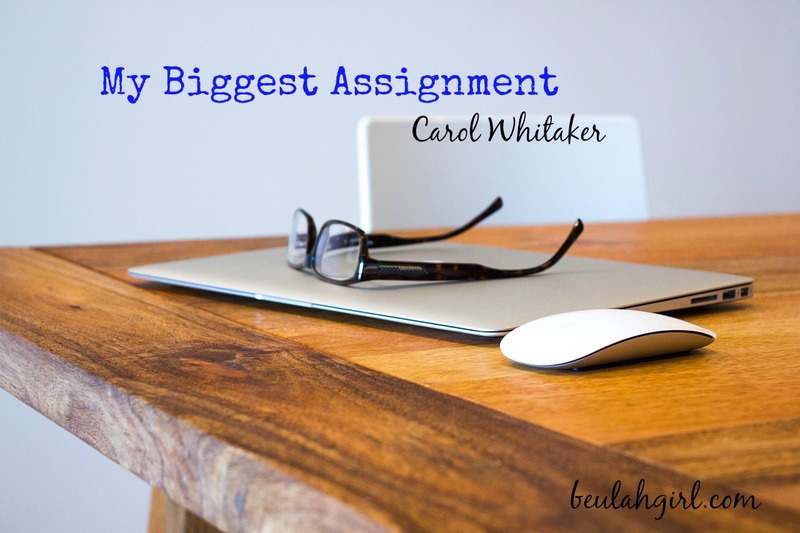 I didn’t see Him work on my behalf until what felt like the last minute many times as I actively committed myself to following Him in a direction away from my career in education. In my experience, the voice of Jesus is that still small voice — and one that can easily be drowned out by the voice of fear and doubt. Fear prevents us from stepping out and doing what we should because we dread the consequences. Doubt prevents us from stepping out by overwhelming our resolve with rationalizations that contradict what we believe so we get confused and we start thinking that we never heard from God at all. The way to combat the voice of fear and doubt is by comparing what we heard against God’s Word, by prayer (the listening kind) and swift obedience. Prayer times that regularly give the Holy Spirit the opportunity to infiltrate our minds and thoughts help us to constantly know what God thinks about our situation and expects of us. He has promised us counsel on the inside. However, we have to make ourselves available to hear Him. When we do feel He is asking us to take a step, we must act in obedience. When we let doubts creep in, the longer we neglect to do the thing He has asked us to do, the less likely it is that we will do it. Sometimes the opportunity is only there for a narrow moment and then disappears. We may not have the same opportunity open up in the same way again. But even as I sit in the parking lot of this antique mall with all of my precious finds perched around me, I know it is a myth, the storing up. For a brief moment, the shopper subsides and writer awakens. What I am really wanting is not to tear my house apart and put it back together more beautifully, but what I want God to do to me: deconstruct me, clean me up, make me better, streamlined, more beautiful. And at the same time I’m scared He will. This is the rub of my life. The words are now done and the writer goes back to sleep. I have dialogued with no one in particular, but I have somehow worked it all out. 2) Other things scream for my attention. 3) I will choose between them. It is the same for you. What prevents me from hearing God isn’t that He doesn’t speak to me. When I make time for Him and quiet myself enough to hear His voice, He generally does speak to me. It’s not always the answer I want or expect, and it doesn’t always come on my timeline. My problem is that I don’t always want to listen. What about you? What is your biggest struggle when it comes to hearing from God? I would love for you to leave a comment below. I read in a recent devotional by Mark Batterson that most people have a lot of ideas about how to parent until they actually become parents. And then I had kids and discovered my kids are often like that. Parenting is not as easy as it looks, and my kids behave in ways I never thought they would. I am often baffled by my daughter’s sassy mouth and my son’s refusal to eat his dinner. (He would prefer to live off of Goldfish.) I often feel like a failure. Totally ill-equipped. Take potty-training for instance. When it was time to potty-train my daughter, I really was quite optimistic. I invested in an Elmo potty video, sticker chart and princess potty seat. I talked to her about the process and demonstrated in my most enthusiastic way how to sit on the potty. I remember thinking, “I got this. I was a teacher. I took human development classes.” I am Mommy lion. Watch me roar. Whoa! Where did that come from? Could it be that my incentives, videos, potty seats and altogether awesome parenting just wasn’t working? Part of me just wanted to force it — just make her sit on the potty, punish her when she didn’t do the business. But another part of me felt a little warning. Since the Bible doesn’t have much to say about teaching one’s child to use the commode, I decided to pray and ask God how a godly parent should approach this potty training nightmare. What was I doing wrong? When I prayed, the word “control” popped into my mind. Control. I was so busy dominating the situation that I wasn’t even really even noticing that my daughter wasn’t learning. She was shutting down. And I noticed something else. Somewhere along the line I had adopted the philosophy that Christian parenting meant I was big, bad parent disciplinarian at all times. However, this isn’t really Christian parenting at all. While a godly parent may take a stand when her teenager announces he is dropping out of school, say no when the kindergartener asks for an iphone, or insist that her three-year-old eat chicken and rice rather than a Pop-Tart for dinner — it doesn’t mean a totalitarian approach that does not take into account the needs of the child. A Christian parent is one who constantly considers the special make-up and temperament of her child and works to create an environment that best encourages this child to grow. You know what I found? Ephesians 6 emphasizes not only that children must honor their parents but that parents are not to “exasperate” their children. “Exasperate” in the Greek means “to provoke to anger” (Strong’s Concordance). Parents have a tremendous responsibility to keep their power in check — not to force submission just because they can. They have a responsibility to not discipline in anger or abuse their God-given authority. And while children have a responsibility in turn to honor parents, parents can make it easier for them to do so by being the kind of patient, loving example God intended. I will be the first to admit that I am not very patient. It takes a lot to work to be patient, especially when children do careless, irritating things. And quite frankly, children always seem to be doing careless, irritating things. When my daughter simply informs me that she won’t use the potty (not because she can’t but because she won’t), or when my son sneaks cookies when I just told him he can’t have more, I lose all sense of resolve to be patient. I find myself yelling and blaming and threatening. Here’s the thing: I am not going to be perfect, but I can continually work toward the goal of asking for God to help me be the kind of parent who doesn’t use my power in an unhealthy way. I can work to understand and unravel each of my children and strive to figure out how God hardwired them, using self-control when they don’t react to situations the way I would want them to and keeping my anger in check so they know that I am correcting wrong behavior — not telling them that there is something wrong with them — when I discipline. I can apologize when I blow it and admit that I make mistakes. Ephesians 6 emphasizes boundaries but also relationship with the child. This style of parenting takes a whole lot more work than screaming incessantly at the kids from the recliner. It requires walking alongside kids as they encounter the various milestones of life, listening to their concerns and allowing them to have a voice. And that is maybe why some parents (myself included) fall so easily into the other method. Tyrannical parenting doesn’t take much work. My first attempt at potty training my daughter failed miserably. I had to give up the endeavor entirely for several months until some of the negativity that had built up around it subsided. We didn’t start again until after her third birthday. This time, I approached it differently — with less pride in my parenting skills and more dependence on the Holy Spirit. I explained to my daughter that we were going to try wearing underpants, but this time I didn’t force her to sit on the potty or get upset at her when she didn’t. I told her the consequences of not using the potty: she would be very uncomfortable in her underwear. But I let her make the decision. We brought back the incentive system, but this time I tiered the rewards — she got a sticker just for sitting on the potty at first to give her encouragement. This in turn gave way to other rewards for actually doing business. And when she was terrified to go #2, we prayed with her and talked her through it and presented her with a doll as a reward. But we didn’t force it. 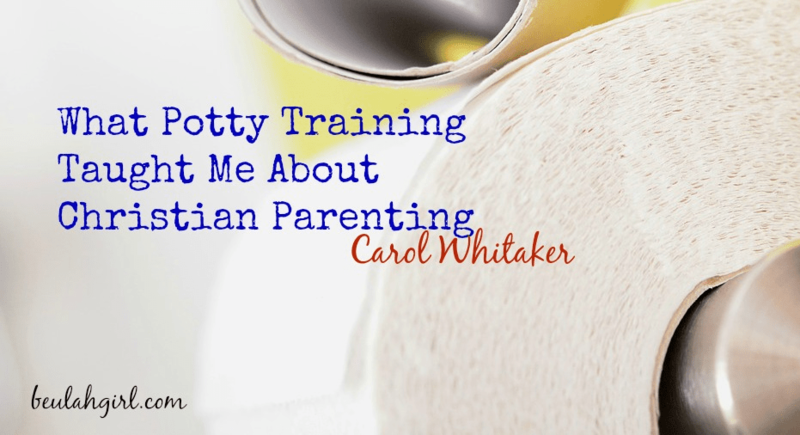 The potty training lesson for me was never a lesson about how to potty train my daughter. It was a lesson in how to give up my control and look to God for the best ways to guide and instruct my daughter as she acquired this important life skill. I still struggle to know at times how to parent my children without unfairly manipulating my power. However, my greatest lesson has been to learn that my children are really not mine — they are God’s, and I am being held accountable for how I parent them.